"Built between 1888-1896 in Asheville, N.C. for George W. Vanderbilt, "Biltmore House" is America's largest residence. The estate is visited by more than 1,000,000 dazzled tourists each year. My challenge in painting Elegant Evening at Biltmore was not to convey the heroic scale of this fairy-tale castle, but to make it warmly personal. I utilized glittering lights to suggest a festive evening affair in progress. I invite you to climb aboard your elegant coach and join the celebration." Elegant Evening at Biltmore copyright© 2007 by Thomas Kinkade is prohibited from being copied. 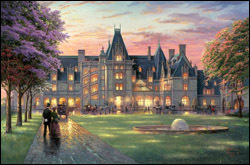 Thomas Kinkade art, elegant evening at biltmore, Biltmore Estate, mansion paintings, Biltmore House, Elegant Evening at Biltmore, estate art, estates, mansions, Thomas, Tom, Thom, Kincade, Kincaid, Kinkaid, Kinkade, art work, canvases, images, paintings, pictures, and prints of Elegant Evening at Biltmore Estate by artist Thomas Kinkade for sale. Elegant Evening at Biltmore painting by artist Thomas Kinkade can be purchased in art print or canvas form at special sale prices at Christ-Centered Art.